In keeping with hikes that are NOT described in the local guidebook , this is a trip my old diehard bushwacking buddy Malcolm and I made this past weekend. Grey ridge is the prominent ridge on your right as you drive from Whitehorse to Carcross. I suppose there are many ways you could go about it, but this seems to work well. Start at Annie lake and ascend as you would if you were going up to "The Cave". 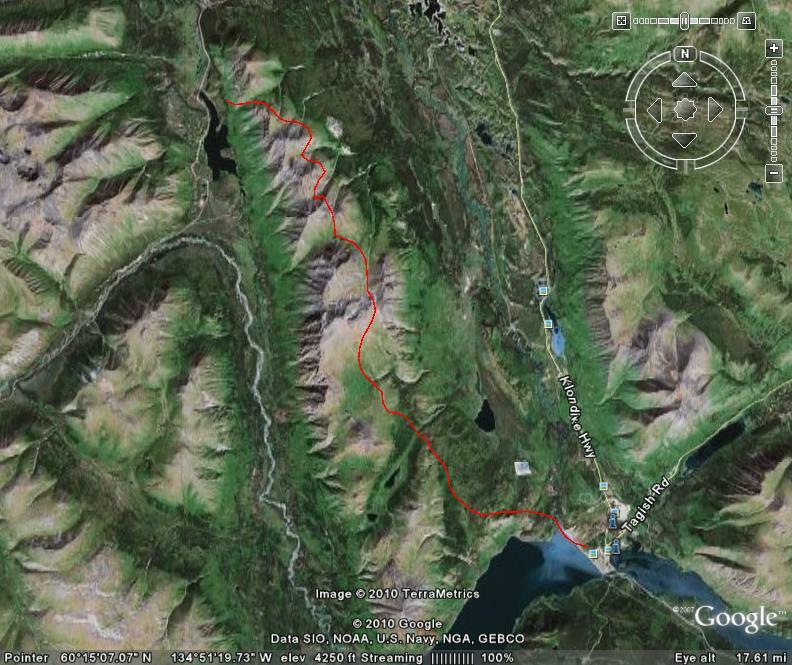 Then keep going through the notch to the East side, and make your way along sheep trails (mostly good, sometimes very good) and benches, through notches, and up drainages until you are overlooking Bennet lake and Carcross, then descend as best you can to the South of Wabona creek and make for the obvious microwave tower, then follow the cut line down to the Watson river, wade Watson river, thence to ice cream in Carcross. 2 solid days, with solid bushwacking to get down to the microwave. Lots of sheep means lots of trails. We were very glad to find as many of the trails as we did, otherwise it would have been a lot harder going. This felt DAMN good I tell ya! You can see the microwave and the cutline in the left background. Camp was at the right most snow patch you can see. A very worthwhile alpine hike near town if you don't mind a bit of bush.